Happy Birthday Master Tatsuo Shimabuku! Kanpai! Shimabuku 島袋 was born in Chan village on September 19,1908, Meiji 41 – year of the “Monkey”. 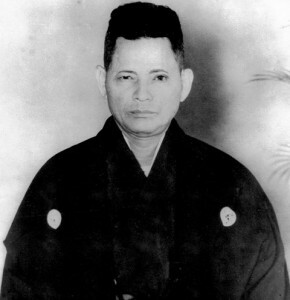 His given Okinawan name was “Kana” and his given Japanese name was “Shinkichi“. As an adult, he chose the name “Tatsuo” – 龍夫 Dragon Man. When naming his sons, he split the characters for Shinkichi, naming his first son Kichiro and his second son Shinsho. This entry was posted in Uncategorized on September 19, 2013 by Sensei Koszarsky.